Congratulations to Myra Dunlap who won an autographed copy of AIM from last week's blog. Some books defy genres. Longbow Girl is one of them. It is well-researched historical fiction and also a meticulously crafted, time travel novel. No easy feat, but one that Linda Davies pulls off with aplomb. If you study this beautiful cover, you'll get a clue as to what this amazingly-plotted tale is about. Fifteen-year-old Merry Owens is descended from a long line of longbow warriors. But she is unique: she is the first girl to master the bow. The opening chapters set up Merry's stubborn, smart, and loyal personality as well as her problem: unable to pay his bank debt, her father may have to sell their family land to their wealthy neighbors. This estate just happens to belong to her best friend--James DeCourcy's--parents, the Earl and Countess DeCourcy. The young people do not condone the rivalry between their families that spans generations, and instead, champion each other's dreams. Merry will do anything to keep the land in her family. But how? Her dilemma is compounded when she finds an extremely rare and valuable copy of the Mabinogion, a collection of eleven stories collated from medieval Welsh manuscripts. While it is in her possession her life is threatened and she considers how to get rid of it to protect herself and her family. The book speaks of a treasure near a waterfall in a riddle pool. Risk-taker that she is, Merry follows the book's directions in order to try and find the treasure which could save her family from financial ruin. Her decision is full of high stakes danger as Merry finds a watery tunnel (later she names it the river of time) which brings her to a land that looks vaguely familiar. The land is filled with people that look like her family and the DeCourcys. Gradually, she realizes that she has traveled "500 years from home." When she discovers that her ancestor has been falsely imprisoned, she has no choice but to try and rescue him and save her family's legacy. If he dies, she reasons, she may never have been born! 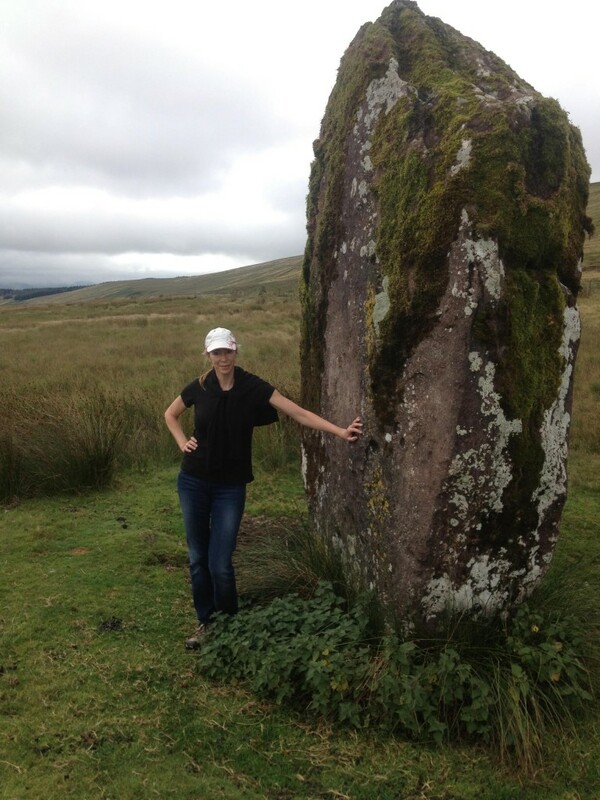 Linda Davies next to Maen Lila, the Neolithic standing stone that guides Merry. This action-packed story is full of Merry's and James' gut-wrenching choices which hook the reader. 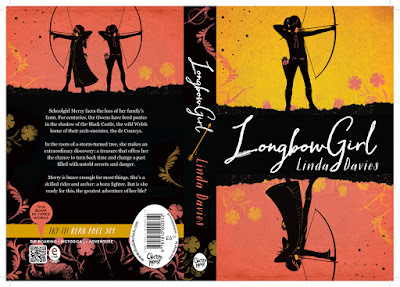 Merry's survival and longbow skills are tested; James' physical prowess and ability to deceive his captors are tried; and both young people prove that their friendship can not only withstand immense challenges--but grows stronger as a result. The novel is full of high action adventure, but Davies does not neglect to show both characters' internal struggles. Although writers are instructed to "show, not tell," Davies names feelings such as anger and relief. To be honest, that never bothered me. But there were some loose ends which I wondered about. What happens to their antagonist, the evil professor who follows Merry back through the tunnel. Does he get trapped in the time of the Tudors? Similarly, a wild stallion follows Merry into the 21st century. Why doesn't her father question his sudden appearance? Since I listened to the audio version, this review is not as full of quotes as most of my book reviews are. But I jotted down this memorable line. Merry is facing capture and possible death and she thinks, "The 16th century was not a playground for the privileged children of the 21st." At first, I was a little put off by Emily Wilden's Welsh accent. But fairly quickly I adjusted to her manner of speaking and when I finished listening to the performance, her voice stayed in my head for days. Ms. Wilden annunciated her words well and helped the reader form an emotional connection to the characters. Since I listen to audio books in the car, I often couldn't wait to be driving somewhere to hear what happened next to Merry or James. Listen to this excerpt and you will get a taste of Ms. Wilden's reading of Chapter 2. You will see how it adds authenticity to this Welsh tale. This book will make a wonderful gift to a teen reader who likes fantasy--but make sure you listen to it yourself first! To enter this giveaway, leave me a comment on my blog by December 1. PLEASE leave me your email address if you are new to this blog. Continental U.S. mailing addresses only. 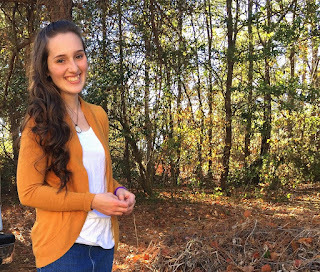 Here is the NaNoWriMo update from teen writer, Sydney Kirsch. As of midnight on November 26 she had written 51,692 words. She said, "I've spent most of the week outlining scenes I still need to write in the middle and end of my story which has been so much fun. But I'm prepared to get it done now, and and I think my first draft will actually be complete by the end of the month!" Next week Sydney will share more about her work and what she learned in NaNoWriMo 2016. 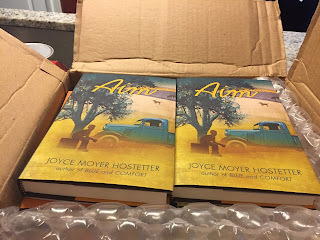 Teaching Fiction, Using AIM as a Mentor Text, and a Giveaway! As I mentioned two weeks ago, I recently completed teaching an eight-week class in writing fiction. I knew Joyce Hostetter's recent book, AIM, would appeal to both boys and girls and chose it as a mentor text for the class. Here are a few more reasons--from the perspective of my teen students--why you should read this book or purchase it for your favorite young reader. Using the worksheets linked below, we brainstormed a fictional character and put him in a setting. We thought about his internal and external goals, potential conflicts, and the various directions his story could go. The quotes from AIM are ones the students selected to demonstrate each story component. Grandaddy's gray hair was flat on one side from sleeping on it. I nudged his leg with my knee. "I brung your supper." 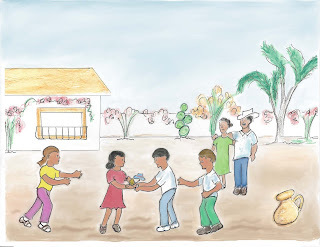 After a discussion about the difference between internal and external goals, the class decided that Junior's external goal was to help his mother and his internal goal was to gain respect. I peeked through the small holly tree, and not far away was Ann Fay with Leroy. He had a finger over his lips, reminding her to be quiet. I could see they had their eyes on my squirrel! 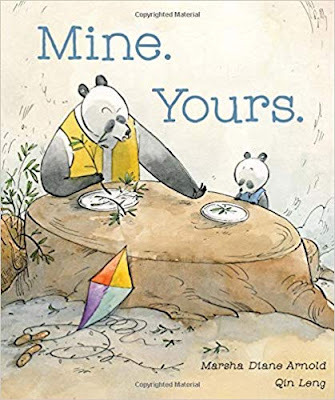 In this selection we talked about the conflicts that were going on in the outside world (the beginning of WWII), the problems between Junior and Dudley, and the conflict between Junior and his teacher, Miss Hinkle. Grace W. wondered if Miss Hinkle was Junior's antagonist. "Sit down, Junior." She said it real low, but there was something in her voice that told me I better listen. Or else. So I sat. But inside I was standing up. Inside I was marching to the back of the room and jerking that Dudley Catfish Walker up and showing him what a Democrat could do to a Republican. If he wanted a fight, I was a mind to let him have it. Dudley shook his head. "Just think about it," he said. "We won't be stealing because we're bringing it back. After all that woman has put us through, don't you think she owes us a little something?" "There's nothing to think about," I said. And I meant it, too. When we talked about the concept of antagonists, we considered why Dudley acted the way he did. The students readily agreed that the abuse he suffered as a child laid the groundwork for his anger and bullying. "I learned that enemies can sometimes become friends." ~Grace W.
"Well-sketched and memorable characters don't have to be complicated. Mrs. Hostetter did a great job of portraying characters in just the right setting and characteristic dialogue; simply and effectively showing, not telling, their personalities." ~Olivia R.
Look closely for some items from AIM! "AIM taught me that people are molded into who they are by their life experiences. That each and every part of our lives makes us who we are." ~Abigail R.
"AIM gave me a great model in which to observe the elements that we studied and practiced in class. I was able to see great examples of what the class as a whole is trying to teach us in terms of characterization, plot development, power words, writing tight, how to handle history and so forth. Where as before I would have read the book and thought "what a nice book, interesting story." Now I could really appreciate the craftmanship and all the work that went into making such an enjoyable story come to life. I can really see how difficult good writing can be." -Kelila M.
"I thought AIM was a good picture to show that whatever habits we develop and tolerate now, can be passed down for generations. Junior was affected by his father who in turn, fought a lot with his mean father." - Caleb R.
For your last chance to win an autographed ARC of AIM from my blog, leave me a comment by Friday, November 25. Please leave me your email address if you are new to this blog. Share this post on social media or become a new follower and I'll enter your name twice. Make sure to tell me what you do. At 9:30 PM on November 19, Sydney Kirsch, our teen NaNoWriMo scribe wrote: "At this point, I am wondering how to word. I mean write. Write words. Also, how do resolutions work?" Here's a favorite line: "... I just need someone who can read a map. I stumbled through the bedroom, hobbling on my good foot. And a horse. Hopping through the mountains wasn't exactly on my bucket list." Judy Martialay has a passion for languages. Specifically, she has a passion to teach children from ages 6-10 that learning Spanish is fun and rewarding. ¡HOLA!, Martialay’s first book, includes a fun story written in English with key words in Spanish, a song, a skit, background information about the cultural context, an art activity, and a dictionary. The material is supplemented by an audio version which parents and educators can download online. 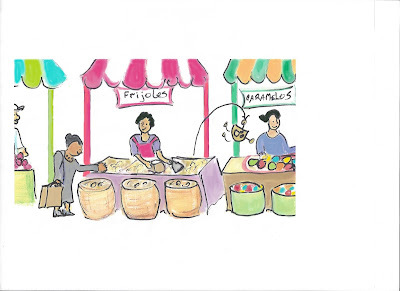 Simple, colorful illustrations by the author amplify the content and engage readers in the story. The combination of these activities makes this an attractive classroom or homeschool book. 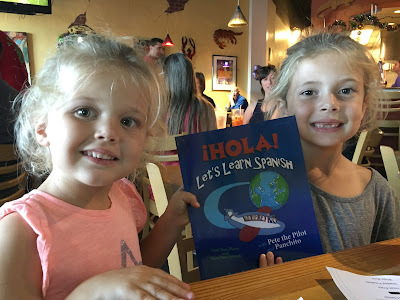 When I received my review copy, I first thought I’d pass the book along to my daughter, Lisa Edgar, who teaches middle and high school Spanish. 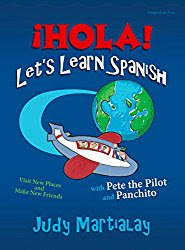 I envisioned she would eventually use it to introduce Eleanor, my youngest granddaughter, to Spanish. But when my seven-year-old granddaughter, Caitlin Kasten, announced she loved Spanish, I thought ¡HOLA! might supplement her introduction to the language. Caitlin is reading above her second grade level so I let her try reading the book herself. Unfortunately, that was frustrating since she’s only just begun to learn Spanish. She enjoyed listening to me read (although Lisa later told me my accent was awful), was disappointed that there wasn’t a second story in the book, and wanted to make the mask. Her four-year-old sister was drawn in by the illustrations and listened attentively while we waited to be served at a favorite restaurant. Libbie and Caitlin enjoyed the story of Panchito, the Mexican jumping bean. After showing the book to Libbie and Caitlin, I next asked Lisa for her impressions. She said it would be a cool book for students at the elementary school level. 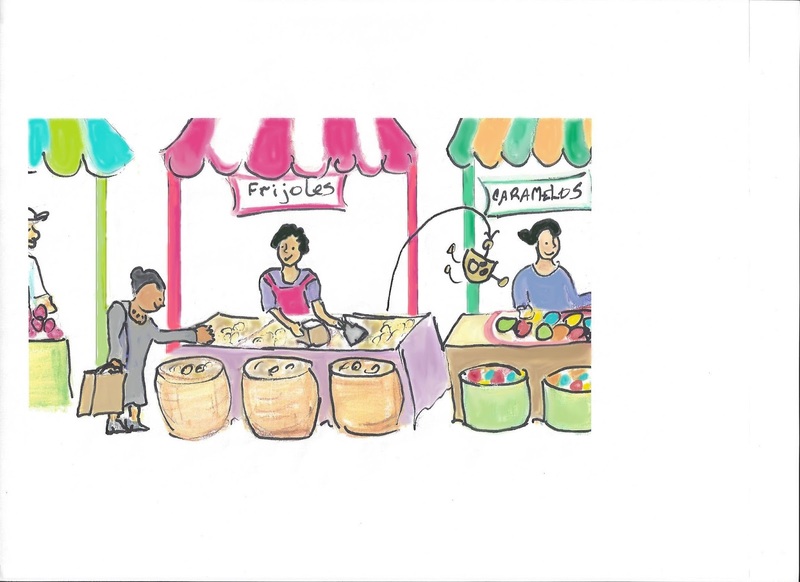 She liked how the reader was introduced to the meanings of different vocabulary words and how Spanish words replaced the English in the text and was bolded to further capture the student's attention. “The repetition of Spanish helps a child remember the words. The multiple opportunities for kids to see words in context is also good,” Lisa said. As a teacher, she thought that using words found at home or in the supermarket was attractive. Eleanor listening to ¡HOLA! for the first time. I finally decided that the book is making it’s first home with Caitlin. I asked her to share it with her Spanish teacher and I'm sure she'll soon learn to read the story on her own. ¡HOLA! will get passed down to Libbie and since it is part of the Cousins Club collection, it’ll eventually be back in Eleanor’s hands. And who knows? 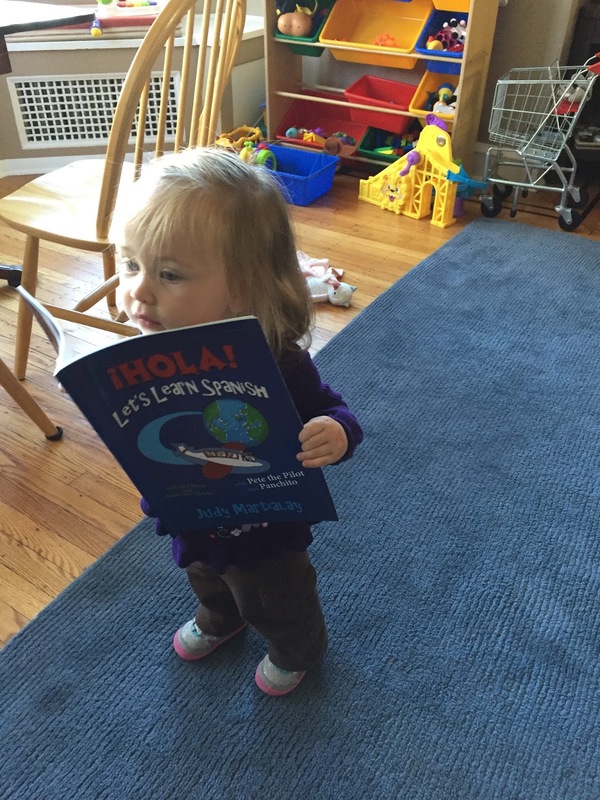 If her mommy starts talking Spanish to her soon, she’ll be reading it to her grandmother one day—with a better accent than I can ever manage! Judy is working on a book to introduce children to French, BONJOUR! LET'S LEARN FRENCH, featuring Louis l'escargot, France's favorite snail. Like ¡HOLA! it will include a story, activities, culture, song, and craft: How to make an impressionist style painting/picture. She also hopes to publish similiar books in Chinese, Arabic, and Italian. "Awful writing can be fixed... nonexistent writing can't." Word count as of 12:08 AM November 13, 2016: 30,091. For the last eight weeks I have had the privilege of teaching fiction to nine talented teens. When I found out that one student, Sydney Kirsch, was gearing up for NaNoWriMo, I suggested she write about her experience for my blog. Sydney emailed me this post ahead of the due date and I commended her for that. She answered, "Yes, it is a little early, but I'm trying to clear out my brain since I'll be starting NaNo at midnight tonight!" And that, readers, tells you a lot about Miss Sydney Kirsch! CAROL: I understand you’ve participated in NaNoWriMo before. How did you hear about it? Do you follow the rules for adults or for the youth? What did you learn and/or accomplish the last time you participated? SYDNEY: Last year, 2015, was my first time participating in NaNoWriMo. Where exactly I heard about it, I can’t remember, either from a friend or a random blog post. However it happened, I ended up deciding to join sometime in early October and I ran headfirst into brainstorming. 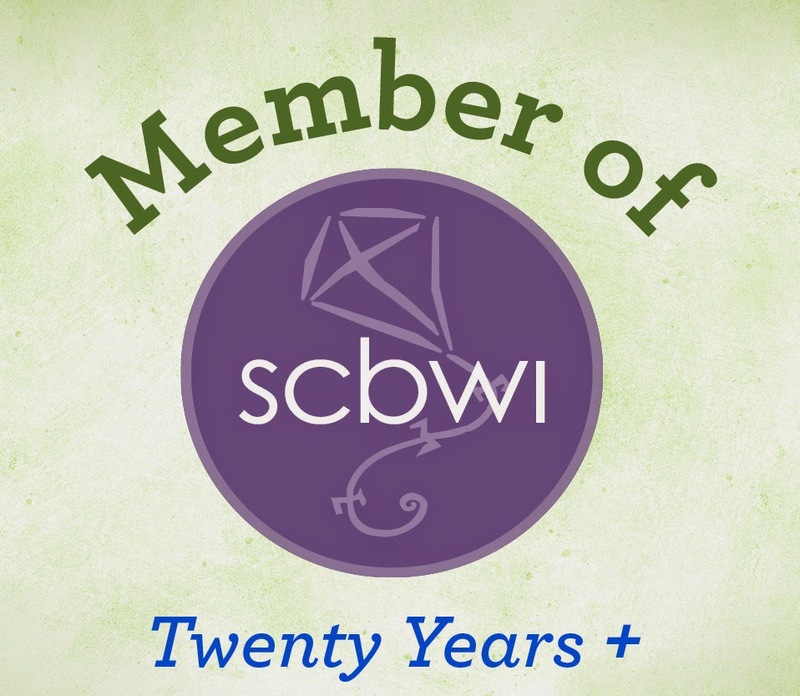 In the beginning, I planned to shoot for 30,000 words in the Young Writers Program, but at some point I decided there was no reason why I shouldn’t just go for the full-on 50K. So by the end of November, I was the proud owner of my very own set of baggy under-eye circles, fifty thousand words, and a half-finished novel. Before starting NaNoWriMo, I had heard over and over and over that to get to 50K you have to put down as many words as you can. No editing. Just spilling whatever comes to mind. Well, the biggest thing I learned last year is that the word-spewing method does not work for me. When I write, I tend to lean to the side of overly descriptive and not-exactly-necessary-but-pretty writing. You can imagine how that ended (let’s just say there may or may not have been an entire paragraph describing omelets). So, 50,000 words swirled by and I was left trudging through the middle of my first draft. CAROL: What did you do with your story after writing it last year? Can you give us a synopsis? Once the great NaNo sprint was conquered, I tucked my unfinished file away, planning to peek at it again in a month or two. That time (or double that time, let's be honest) passed. I still couldn’t bring myself to look at what I’d written. Just recently I worked up the courage to print a full copy and sit down to rip my half-novel apart. Rereading it was a kind of wonderfully miserable experience. Like I mentioned before, the novel is still not finished. Whether or not I'll ever go back to it, I can’t say, but for now, I don’t think it would be rewarding enough for the trouble. CAROL: You're in good company of other writers with unfinished projects buried deep within their computers. Last year did you use any of the support groups associated with NaNo? If so, which ones and how were they helpful? SYDNEY: One of my favorite things last year was going through the forums on the NaNoWriMo website. There were so many helpful tips and ideas all gathered into one place there. My favorite of the NaNo resources, though, is by far the NaNoWordSprints account on Twitter. They’re constantly hosting mini-competitions during November. I was just racing against my own time, but that pushed me toward 50K more than anything else did. CAROL: How did you prepare in 2015? How did you prepare this year? SYDNEY: I am an outliner, through and through. Last year, I took a very detailed, three-act approach to planning, which was helpful, but I can see now that having every thought planned out ahead of time actually constricted me in some ways. So this year, I’m leaning toward a more general “beginning, middle, ending” roadmap to go by until I break it down further once the writing actually commences. CAROL: When did you start preparing for Nano? SYDNEY: I’m always gathering ideas for stories, but it wasn’t until June that I really started thinking about specific ideas I wanted to write about this November. It began with being aware. Noticing things. My family was reading through Deuteronomy, and in chapter 3 it describes these massive people living in gigantic cities, sleeping on enormous beds. And that intrigued me. It sounded like something I would want to write about. So I put the idea on a list and pinned it to the corkboard above my desk. As far as actually sitting down and connecting the dots, though, that didn’t happen until a couple of weeks ago. CAROL: How are you using what you learned in our fiction writing class for your preparation? SYDNEY: Well, just about everything I’ve been working on in class these last few weeks has become helpful in some way or other. Surprisingly, though, one of the greatest things I’ve put to use seems obvious: having other people brainstorm with me. Since actually trying this for my NaNo project, I found it hard to believe how many times I was clapping in delight at someone’s suggestion for my story. You’re a brilliant human! How did I not think of that? Another big thing for me was simply learning about mood. Before, I had only a vague idea of what a good scene was like. When something wasn’t working, I wasn’t able to point out exactly why. Now, though, I can work at keeping my moods consistent and smooth. CAROL: What is your story about this year? SYDNEY: I’m writing an urban fantasy including a pair of sisters, a mind-reading (but mute) bird, and a quest to spare three necks from a giant’s blade. That’s my current plan, anyway. CAROL: That is an intriguing pitch! What is your goal in completing this story (besides making it to 50 K words)? SYDNEY: Well, I have two goals. One is kind of achievable, the other is insane. My realistic goal is to work toward better characters. My entire writing life I’ve struggled with creating unique people for my stories, and I think my main difficulty is that I’m afraid. Good characters are realistic ones. Not perfect. And to write them you have to crack yourself open and be unflinchingly honest about what and who people are. I’m not good at that. Yet. And my unrealistic goal? To finish a first draft no matter how many words it takes. This really terrifies me, because that leaves me with two options: I can really cut down the way I portray and describe things in my first draft so I can get through an entire story in 50,000 words. Or I could write 80,000-100,000 words during NaNo and have to CUT, CUT, CUT later. Will either of these happen? I don’t know. But I’m hoping that going into this November thinking, I am finishing this story could be invaluable to me. 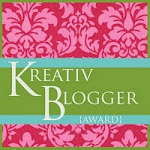 Stay tuned, blog readers! One month from now, Sydney will share what she accomplished during NaNoWriMo 2016. 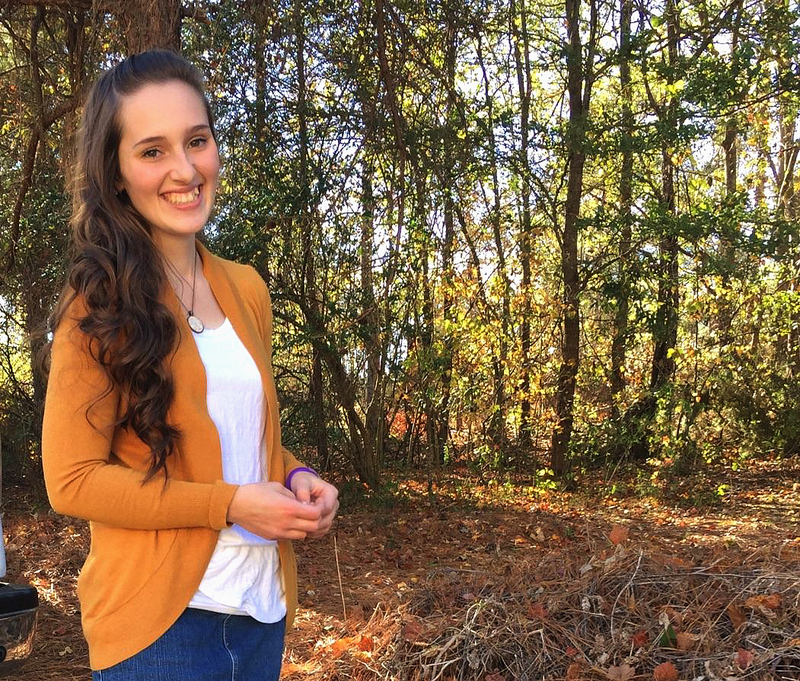 Sydney Kirsch is a young writer, word enthusiast, and story collector who lives in upstate South Carolina. She is the oldest of ten and when she’s not hidden away with a book, she can be found at a piano, teaching historical dance, or singing musicals with her younger siblings. A high school junior, follow her on Twitter @hmskirsch.